Feel free to share some of your best Submarine adventures or strategies on the comments below. Oh, and don't just take my word for it on this games surprising depth and brilliance. 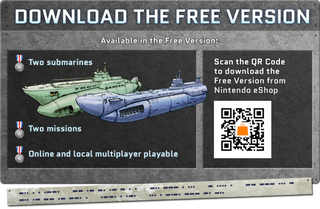 I would love to have an expanded version of this on Wii U and have better options to play with friends or organize Submarine clans. Even if everything else fails to impress you into buying the premium version, at least you will be able to say in future conversations: "Yeah, I do know Morse code. Learned it from a Nintendo video game back in 2014." I was going for my usual "Play Hard, PLAY LOUD!" trademarked farewell, but for this time only it's better you "Run Silent, RUN DEEP!". Shiryu Urawaza: If your Submarine takes damaged beyond your comfort zone, surface and broadcast the most easily remembered Morse code message of all time: "... —- ..." which universally translates as "SOS". An allied plane will fly over and drop a repair crate near your position. Beware however it only works once, so the next time you see something flying towards you it's an enemy bomber!